GMT Orange Brown and White livery 1.0. A 1980's repaint that was worn by Leyland Atlanteans. Also, it appears you've painted the mirrors orange, I think you may have messed up your layers. Finally, I've compared it with a copy I have on my laptop and the real thing - I'm afraid you've not got the right font for the GMT logo, its supposed to be Helvetica Bold. Fix all that, and I think this will go a long way. 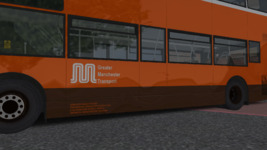 I've got this fixation for Greater Manchester Buses, and it'd be nice to get a proper GMT livery or two for OMSI 2. 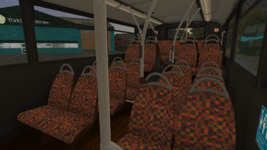 I've never seen these buses IRL before, but just by looking at the pictures, I can see that you have invested a lot of effort into making this reskin.